We connect to your IP camera to stream the video feed to YouTube Live. Fixed monthly pricing not limited by the number of viewers (by using YouTube Live). Only a single connection from your camera to our servers. Support a lot of viewers even on a slow camera connection. We transcode the video stream from your camera to a valid encoding for YouTube Live. Fixed price. Up to Full HD resolution. The transcoding supports Mobotix MxPEG encoded streams to save bandwidth with non-H.264 cameras. We collect still images from your camera and render a daily time-lapse video in full resolution. Embed the live time-lapse player into your website to always show the last hour until now (or day). We host your images and deliver them through a fast content delivery network (CDN). 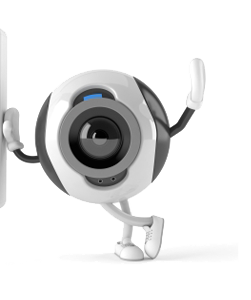 Add brand name and timestamp to your webcam images. Also dynamic data like temperature. Use FTP upload (push) or set up an image URLs (pull) to transfer images to our servers. Full resolution time-lapse videos are created every day at midnight using your webcams still images collected through the day. Download the H.264 videos in mp4, webm, ogg format for archiving or sharing. Create clips from your time-lapse player by marking in/out frames. Clips are displayed below your time-lapse view and can show the highlights of you location, i.e. the best sunrise.